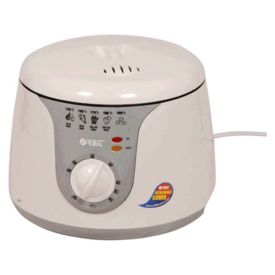 2 liter stainless steel bowl, temperatuer control, detachable handle for cooking mesh, aluminium net basket for easy frying, cool touch body.The orbit deep fryer makes it possible to enjoy healthier versions of your favorite foods by frying them with a tablespoon or less of oil and draining excess fat during cooking. Food becomes crispy on the outside and tender on the inside with little to no oil.The Skyline deep fryer makes it possible to enjoy healthier versions of your favorite foods by frying them with a tablespoon or less of oil and draining excess fat during cooking. Food becomes crispy on the outside and tender on the inside with little to no oil.Orbit is committed to building strong partnerships through end- user focus, customer satisfaction and continuous system enhancement to bring to the consumer the latest products of the highest quality. A Perfect product for your needs. 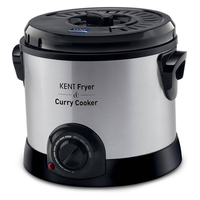 2 liter stainless steel bowl, temperatuer control, detachable handle for cooking mesh, aluminium net basket for easy frying, cool touch body.The orbit deep fryer makes it possible to enjoy healthier versions of your favorite foods by frying them with a tablespoon or less of oil and draining excess fat during cooking. Food becomes crispy on the outside and tender on the inside with little to no oil.The Skyline deep fryer makes it possible to enjoy healthier versions of your favorite foods by frying them with a tablespoon or less of oil and draining excess fat during cooking. Food becomes crispy on the outside and tender on the inside with little to no oil.Orbit is committed to building strong partnerships through end- user focus, customer satisfaction and continuous system enhancement to bring to the consumer the latest products of the highest quality. A Perfect product for your needs.